My friend Riette from book club invited me to join her Friday night to see author Michael Cunningham speak at Theater aan het Spui. This American author is most known for his Pulitzer prize-winning book The Hours, published in 1998. I read that book years ago. I was impressed by his writing style, but also remembered longstanding traces of melancholy from the reading experience. Nonetheless, I jumped at the opportunity to attend a Border Kitchen presentation and hear him speak. I picked up a copy of his latest book The Snow Queen, which he would be discussing at the event, two days before the reading. Within the first five pages, I was completely drawn in. Not in a Da Vinci Code, page-turning way, but in a poetry turned novel walk-about within the inner workings of people’s minds, hopes, aspirations and connections. His unique descriptions had me looking at the world through foreign eyes that created devastating beauty where I had only seen ugliness. A man snorting cocaine in the morning was somehow transported by grace in Cunningham’s prose; the unspoken bond and understanding between two brothers is dissected and lain forth; not with the precision of a scalpel, but with a poesy of shocking sensualism. 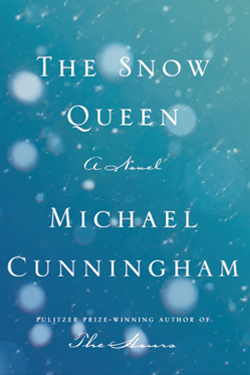 Hearing Michael Cunningham read a passage from his book aloud transformed the beauty of his writing to an oral language of tradition beyond the words themselves. After unsuccessfully trying a line of questioning about how being a gay man informs Cunningham’s writing, the interviewer finally changed tactics to a more relevant subject; the author’s writing process. As a teacher, Cunningham informed us, he encourages his students to find their own writing process. With that disclaimer, he shared his approach: daily, steadfast writing, without the influence of drugs or alcohol; no checking emails during the writing process, rewriting a sentence or passage again and again until it is right, not always being in collecting mode as a writer. In other words, although he is observant to the world around him, and his characters are informed by others, he also allows himself to go out with friends and interact with the world as Michael Cunningham the person, not as a writer looking for inspiration for his next plot. He admitted that sometimes he re-writes one sentence a hundred times. A hundred times? He also writes enough content for two books during his writing process and in the end, only uses about half of it. Talk about killing your darlings; that’s a 50% kill rate. I had more than one “aha” moment during the evening, but the following insight was a big one. Cunningham explained a phenomenon that occurs in his writing. When he reaches page 70 or 80 of a new novel, he is sometimes overwhelmed with the conclusion that the novel is not what he set out to write. Thus, he starts another novel, and so on and so forth. But finally, he realized something; novels will never be that rigid thing you pictured in your head, because characters and plots develop on their own, becoming bigger and other than you imagined. Letting go of those preconceived notions and limits lets the book breathe itself into existence. I’m paraphrasing here, and adding my own interpretation of his words. But as an author who has stopped an attempted novel at page sixty on multiple occasions for this very reason, this was a light in the muddle of my writing existence, encouraging me to revisit my abandoned manuscripts and approach them Montessori style: freedom to develop (open my mind!) within a controlled environment (consistent writing schedule unhindered by the sister muses of Merlot or gin and tonic). By the end of the reading, I was completely jazzed, excited, ready to embark on a new writing project. Encouraged by Pauline, another book club friend of carpe diem persuasion, I posed for a picture with author Michael Cunningham. After he’d signed my book and disappeared behind the curtain, my friend looked at the iPhone pictures. Most, including the one of me and Michael, had been taken with a flash, creating a muddled gray light around us. Oh! Woe is me! Michael looks more like a devil than my new found inspiration, and I look, well, a bit like a poser in need of Weightwatchers membership than an aspiring author. Despite this rather ghastly digital rendition, for me the moment was one of absolute clarity. 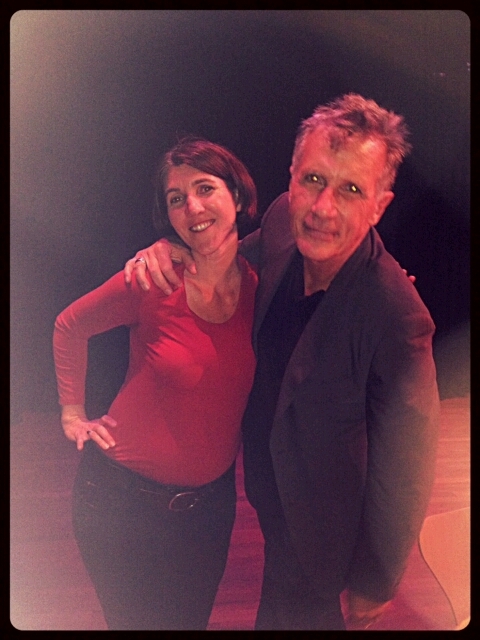 I am a writer and I will continue to persevere as a writer, and I am inspired by this wonderful man, Michael Cunningham the person and the author. I don’t know Cunningham’s writing at all, but if he inspires you, hooray! By the way, just out of curiosity–what is your writing routine? I’d like to hear a blog post about that.